THE STORY - Teenager Nicolas Sheff seems to have it all -- good grades, editor of the school newspaper, actor, artist and athlete. When Nic's addiction to meth threatens to destroy him, his desperate father does whatever he can to save his son and his family. THE GOOD - Timothée Chalamet gives an emotionally raw performance that feels authentic and earns our sympathy. THE BAD - Steve Carell tries his best but feels miscast. Any roles outside of Carell and Chalamet are either underwritten or don't receive enough screen time. The editing is jarring and the climax of the film leaves a lot to be desired despite the true events of the characters. ​​David Sheff (Steve Carell) is a freelance writer who lives with his second wife (Maura Tierney) and their two beautiful young kids in a lovely home surrounded by peace and nature in Northern California. David also has a first son from his previous marriage (Amy Ryan) named Nic (Timothée Chalamet). Once a creative artist who loved hard rock music and all other aspects of life, he is now a crystal meth addict who at the age of 18-year-old is putting himself on a crash course with disaster. It’s a route he wants to break out of but can’t seem to ever find a way to fully commit to his own recovery. Desperate to not see his son die, David tries his best to help and understand Nic, while reliving moments from his son’s youth, back when he was a beautiful boy before he became the unrecognizable man his father sees today. I wish I could say that this would be Timothée Chalamet’s year at the Oscars after his star-making, captivating and deeply affecting work in “Call Me By Your Name” last year left him on the sidelines. However, with “Beautiful Boy,” the new film from Felix Van Groeningen, he will probably find himself as the runner-up once again due to the fact that he is the single best thing in the film’s arsenal. Based on the true memoirs of Nic and David Sheff, this addiction drama goes for the waterworks in a hard way, with lots of scenes involving yelling and crying from all of the main actors. However, Chalamet emerges as the only one with the right combination of authenticity and fulfillment, while everyone else is either underwritten or dramatically forced with their performances. With his tiny frame and sharp facial features, Chalamet is able to convey so much with so little and a little with so much. He’s the only one who is typically able to find the truth in his scenes and interpret them for the screen, giving us what we need in order to be emotionally invested in Nic’s life. “Call Me By Your Name” was certainly no fluke and his legions of fans will be happy to hear that his future continues to look bright as he gives us another committed performance that couldn’t be further away from what he gave us last year. It’s not a discredit to any of the actors that this is the final result. Steve Carell in particular, does the best that he can and has a few solid moments where his pain as a father trying his best to protect his son who might be too far gone is heartbreaking and emotionally affecting. 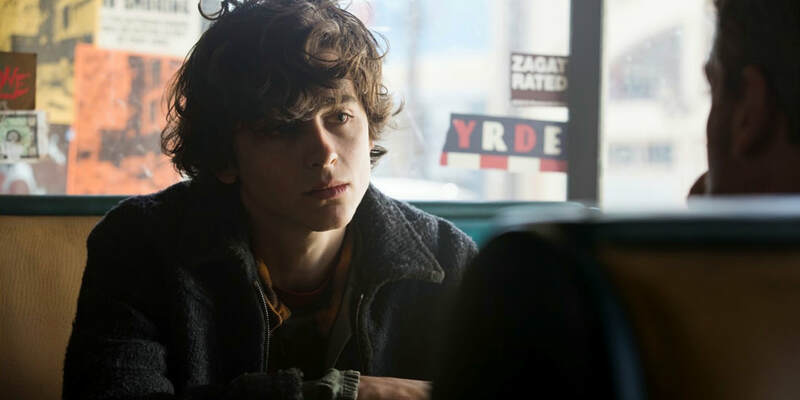 However, there are more than a few moments, whether it’s because of the screenplay, the film’s editing (constantly jumping back and forth through time with poor transitions), musical score (the most heavy-handed score I think I’ll hear all year) or Felix Van Groeningen's direction, that his performance can never hold a candle to Chalamet’s. Considering that Carell is the lead and Chalamet only occasionally comes back into his story, we are mostly stuck having to watch Carell navigate through a performance which in a more efficient film, might’ve been able to land its mark a little bit better. Maura Tierney and Amy Ryan both have their scenes where they too get to cry and show us the pain that Nic Sheff has afflicted upon them as well, but with precious little screen time and not enough character depth, their performances feel more contrived than they do earned within the framework of the story. Speaking of earned, “Beautiful Boy” ends on a moment that is both anti-climatic and unfulfilling considering all of the misery that comes before it. I understand that this is best on a true story and that the journey that the real-life people are on is still ongoing. However, the blame must once again then be placed at the feet of Van Groeningen and not the film’s stars, who are giving it all in a movie that can never find its groove to tell their story in a concise and tonally appropriate manner. When David hugs his son in the film’s final moments, it doesn’t feel like a gut-punch sort of an ending. Instead, it feels like more of the same which we saw play out in other scenes throughout the movie. The final message that the film chooses to end on is a dour one, reminding us that relapse is always a possibility and that the struggle is never fully over despite the support received and progress made. While it may be true to life, after having to sit through an emotional roller coaster of a movie with not a single laugh or light-hearted moment tainted by the threat of Nic’s relapse or even death, this was not the ending I was expecting nor is it the ending which the film earns. It’s easy for those who have never been through such an ordeal to believe that love and support will win out in the end over addiction. “Beautiful Boy” is unable to specifically convey to the audience if the fact that Nic is alive is a win or is it more of the same? Are he and his father destined to be stuck in this endless loop of relapse and recovery? It’s true that Van Groeningen does not need to give us the closure we seek. Instead, he stays true to the reality of the story and presents a film that is just as emotionally depressing as his previously acclaimed film, “The Broken Circle Breakdown.” I only wish “Beautiful Boy” could’ve been as well constructed a film as that one was.